The National Trust of Western Australia and Western Australia’s Water Corporation agreed that heritage aspects of the former Goldfields Water Supply Scheme would be managed by the National Trust. The Corporation’s pledge of $1.3 million in funding enabled the National Trust to begin work on the Golden Pipeline Project with the aim of ensuring the outstanding engineering feat designed and overseen by CY O’Connor is recognised for its impact on the community of Western Australia. 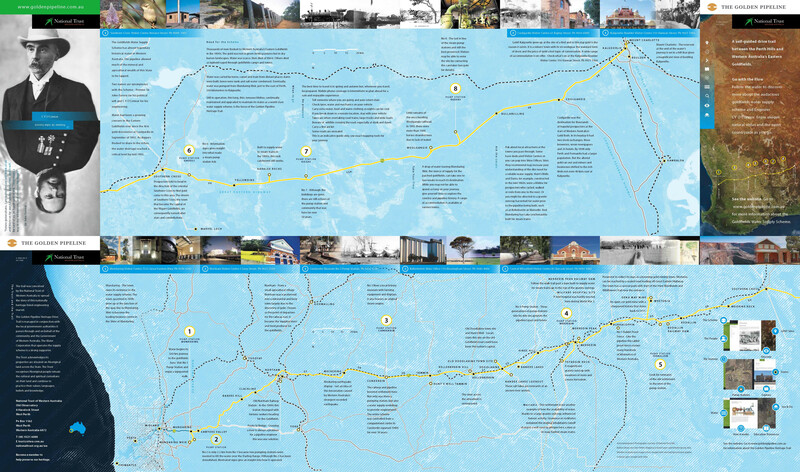 Subsequent grants from the Australian and Western Australian Governments, as well as many others, allowed the development of the Golden Pipeline Heritage Trail (GPHT), a self-drive trail that follows water from Mundaring Weir to the goldfields. This GPHT website has been funded by the Federal Government as part of its commitment to conserve and interpret sites of national heritage significance. a multi-use trail between Mundaring Weir and Northam. The Golden Pipeline Heritage Drive Trail is managed in conjunction with the local government authorities it passes through and on behalf of the community and the Government of Western Australia. The Golden Pipeline Heritage Website was proudly designed and developed by Humaan. The Trust acknowledges its properties are situated on Aboriginal land across the State. The Trust recognises Aboriginal people remain the cultural and spiritual custodians on their land and continue to practice their values, languages, beliefs and knowledge.